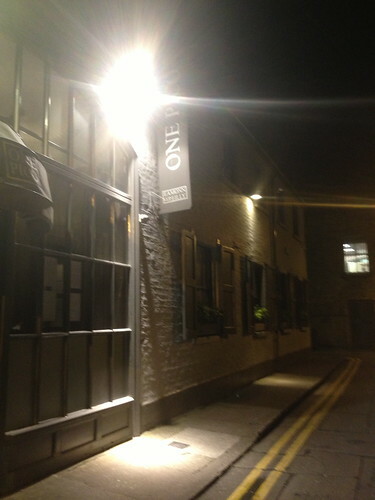 I came across One Pico one evening after parking in Dawson Street carpark and walked past the resto which was just around the corner. The white walls and windows with their shutters and flower baskets made it look very picturesque from the outside. Upon perusing the menu online, there were lots of dishes that looked very tempting which is how we ended up there for dinner one Saturday night. Service was polite and efficient at the start of our meal. After our starters were served and cleared, we then endured a perplexingly long wait for our mains. The resto was only half full at this point yet it felt like the waiting staff were definitely in the weeds, which was worrying. Someone needs to take a long, hard look at the service - only having 1 waiter serve a table of 4 and only carrying out dishes 2 at a time therefore only serving half the guests before returning to the kitchen for the other 2 dishes is amateur for a resto with Michelin ambitions. So too is serving a table of 2 their mains without their side dishes causing the poor couple to look on as their steaks were getting cold and wondering where on earth their chips were. Luckily for us, when our mains finally arrived, there were no further delays. 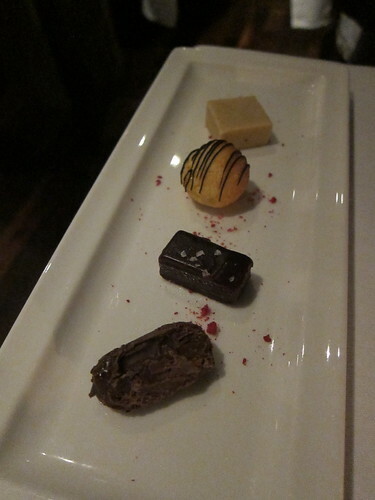 However, I did have to harangue a server to bring my glass of dessert wine after they had already served my dessert. Surely, the definition "dessert wine" hints to the fact that it should be served with the dessert course? Overall, the food was a bit hit and miss (favourite course was the cheese plate which was yummy with my glass of dessert wine......when it finally showed up!) and as I mentioned above, service was a little awry. It sounds like nit-picking but this is service at its most basic level and I expect it to be better if I am paying this much for my dinner. The waiting staff who gave us our bill (possibly a more senior member as he was wearing a jacket) and took our payment was the only member of staff who really did give good service (a friendly French guy). I wanted to like One Pico but ultimately, was left feeling disappointed. 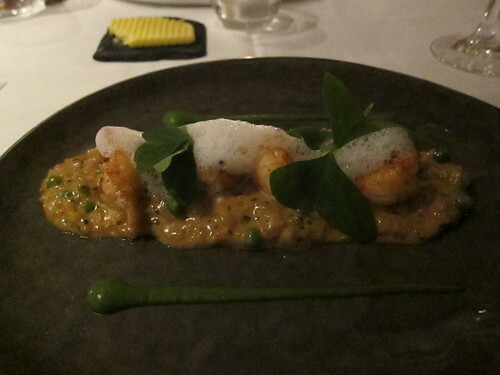 Starter of langoustine risotto, sauteed Dublin Bay prawns, sweet peas and sorrel. The prawns tasted delicious. Unfortunately, they were overpowered by a salty, cheesy undercooked risotto, which had no taste of langoustine whatsoever. 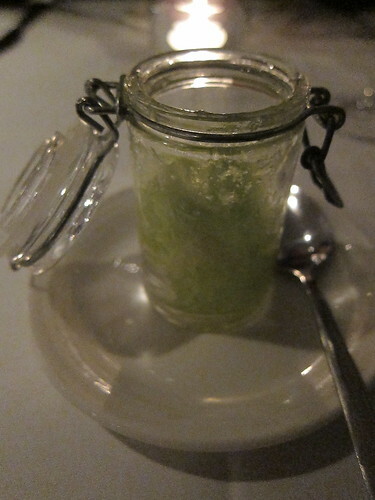 Complimentary palate cleanser of celery sorbet - very refreshing but even with the addition of this course, we still had to wait a very long time for our main courses. 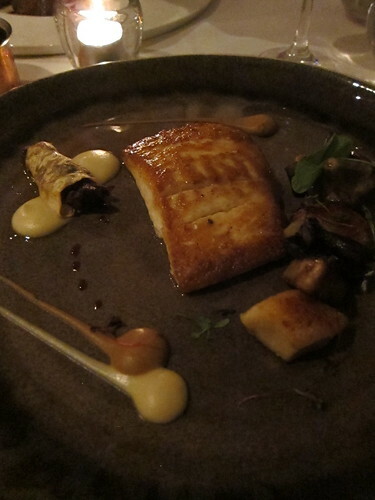 Pan fried halibut with truffle gnocchi, oxtail cannelloni, Jerusalem artichoke puree and ceps. On paper, a very inviting autumnal dish with lots of lovely rich, earthy flavours. In reality, this dish was let down by execution; the cannelloni was dry and chewy which could've been excusable as it was a garnish. Overcooking fish to the point where it is dry and tasted like it had been kept under the passe too long is unexcusable. Selection of cheese - I have never ordered cheese as a dessert but after tasting this selection, I will certainly consider it in the future. 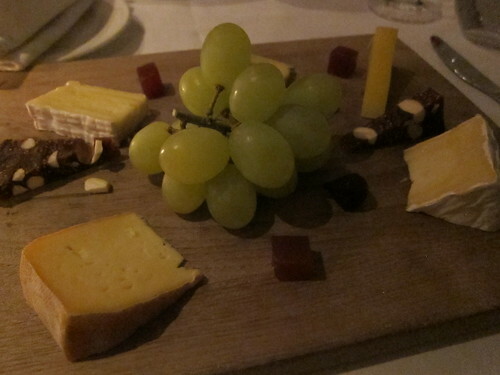 A yummy selection served with lovely crackers, grapes and pieces of quince jelly. Perfect with a glass of Paul Cluver Weisser Riesling Noble Late Harvest!